A huge thanks to Bookingly Yours for giving me this awesome award! 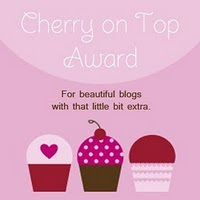 The Cherry On Top Award Rules are: 1. Answer this question: If you had the chance to go back and change one thing in your life, would you, and what would it be? Hmmm, That is a very good but hard question. I don't think there is anything I would change if I had the opportunity. Yes, there have been "Bumps in the road" but everything that has happened whether postive or negative had lead me to where I am now. I took everything as a learning experience and a lesson. Congratulations on the award and thank you for passing this on to me! I appreciate it! Congrats! What a cute award.